Why is Sachin Tendulkar called God? What if the question changed from...why is Sachin Tendulkar called God? 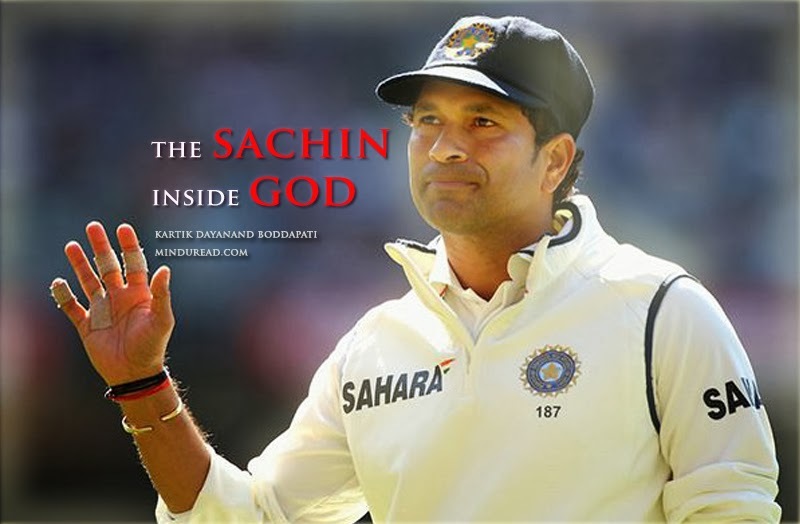 to...what if there is a Sachin Tendulkar inside God? A bizarre thought, but the answers that came up really baffled my mind. Here is what I figured out, summarized in ten points. No matter what the situation is - we gain strength by just knowing that he is a part of our team. As long as he is around, we have faith - we believe we can never lose. Quantifying God through mere statistics and numbers is a futile exercise. The joy derived out of a beautiful sunset or a rainbow can't be quantified, just like a Sachin straight drive. God always gives his 100%, nothing less will do. He chases dreams without resorting to shortcuts. God is always on time, never late for the bus. It is this clockwork discipline that lets him continue to be on top of the game despite the years piling up. It is we people, the mortals who put God on a pedestal. God on the other hand is very humble - we never hear him boast or for that matter, even speak. He only lets his actions do all the talking. God values relationships - he wants us to be nice human beings first. Mothers have the most special place for him - their prayers to keep him fit and healthy and safe are his secret superpowers. Whether he scores a 0 or a 100, we continue to have faith in him. That means a lot to him. God is continuously trying to improve himself. He believes he would have been a lesser God if he did not hear our feedback. Our prayers give him strength. Chants like Sachiiiin Sachiiin are an important source of his energy - they egg him on to do better. Even God needs encouragement. Having realized the above - Sachin Tendulkar the player might retire, but Sachin Tendulkar the man will continue to exist as a God to many, for the lines between the divine and the mortal have ceased to exist ages ago and for good reason! I don’t think I have to say anything more. Bonus point: Sachin loves to receive encouragement from the media and read good things about him, even God likes the same. Don't believe me? Then read this - God sent me a friend request on Facebook!